Sister From Another Mister's Shot@Life! In case you were unaware, this week is World Immunization week,the perfect time to talk about the importance of global vaccinations. Nicole of Sisters From Another Mister, together with shot@life and the United Nations Foundation are very happy to announce a link up to share our stories about motherhood. A Mothers day meme link up opening on May 8th and running until the 18th. We invite you to join us on this journey. And just who are WE? And what is this quest? With a mantra of, Every twenty seconds a child dies of a preventable disease. Only twenty dollars saves the life of a child. Twenty bloggers are making a difference! 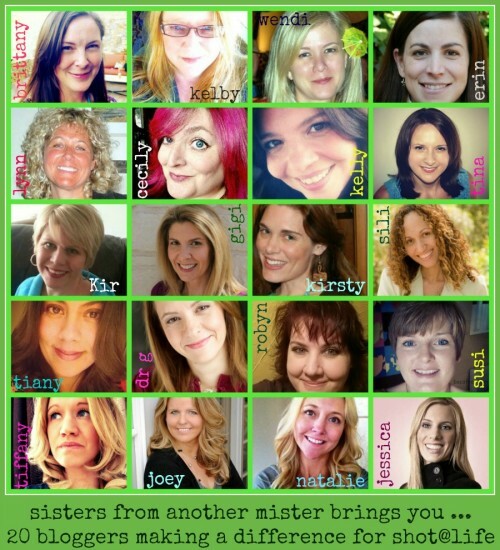 It gives me great pleasure to introduce you to these amazing twenty bloggers. Each one looking to make a difference in the world. Twenty bloggers were invited to be a part of this link up, I am ONE of them! And here we are. In spite of their very busy lives, they have all pledged to make a difference. Not only donating to the fundraising for this campaign, but also donating their time and blogging resources. I hope that you find it in your heart to do the same! On May 8th, the link up will be live on Sisters From Another Mister. Each photo on the grid will take you to the post on the blogger's own bloghome. Linkers and commenters will have a chance to win one of several giveaways. Set aside some BIG chunks of time over those ten days - they are a fab group of writers. You will want to share them all! Please make donations to both link and comment - all donations are tax deductible. Donating is explained on the shot@life donation page. Tell your friends, share and tweet, and read them all. Leave lots of comments, maybe win a prize and ... know that YOU are making a difference!